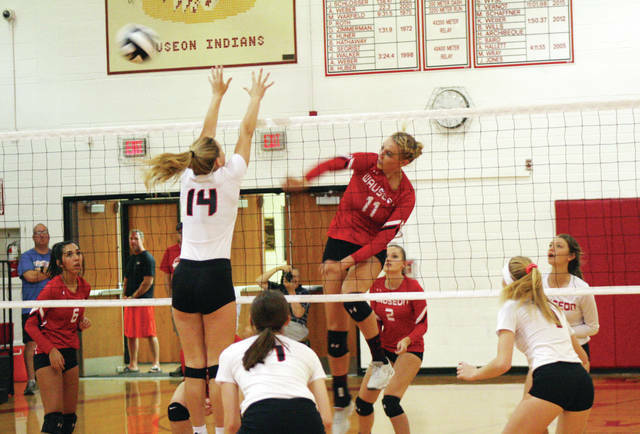 Wauseon’s Lexi Sauber (11) with a kill in a league match this season. She was the District 7 Player of the Year for Division II. Ashlynn Waddell of Swanton shoots one from the left side versus Evergreen. She was named honorable mention District 7 in Division III. 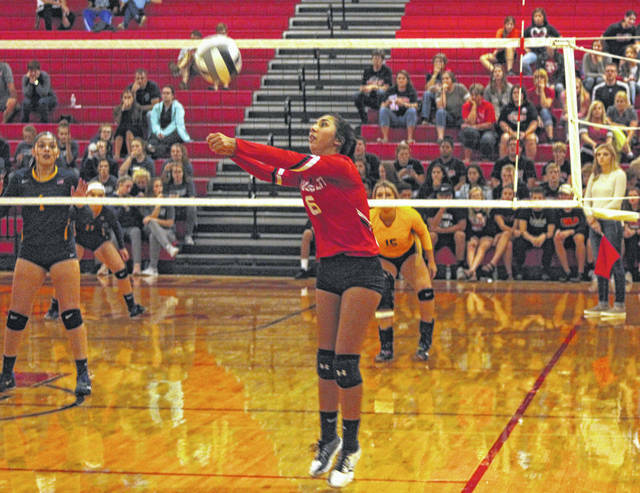 Maddie Trejo of Wauseon bumps one in a match against Archbold. She was also first team District 7. 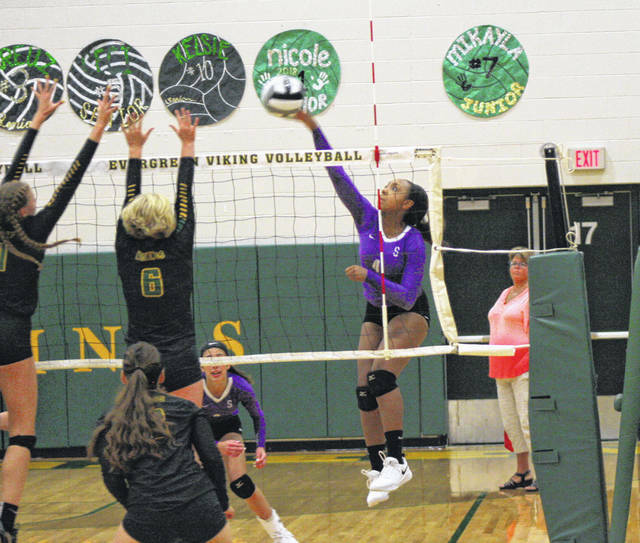 Area athletes frequented the All-District 7 volleyball list that was released recently. In Division II, Lexi Sauber of Wauseon was the player of the year in District 7. Maddie Trejo of Wauseon was also first team District 7. Wauseon coach Bill Blanchong received coach of the year honors. Second team District 7 for the Indians was Kelcy Blanchong. Skylar Reckner was honorable mention. Alexis Sarvo of Swanton was second team District 7 in Division III. Also for the Bulldogs, Ashlynn Waddell was named honorable mention. Evergreen had a pair of second teamers in McKenna Babcock and Claire Conrad. Raelyn Hutchinson of Delta and Kayla Boettger of Archbold were honorable mention. In Division IV, Pettisville’s Morgan Leppelmeier was the player of the year. Blackbird coach John Horning was named coach of the year. Mauricea Crouch was on the second team for the Blackbirds. Lexi Sauber, sr., Wauseon; Grace Delventhal, sr., Lake; Brynn Brown, soph., Maumee; Karagyn Durco, jr., Rossford; Taylor Momany, sr., Lake; Jess Robb, jr., Bryan; Megan Dunne, sr., Rossford; Maddie Trejo, sr., Wauseon. Player of the Year: Lexi Sauber, Wauseon. Coach of the Year: Bill Blanchong, Wauseon. Jamyson Butler, sr., Maumee; Makayla Duckett, jr., Central Catholic; Tataum Miller, jr., Lake; Kelcy Blanchong, jr., Wauseon; Gwen Spengler, jr., Bryan; Maddie Jones, sr., Napoleon; Courtney Whetro, jr., Bryan; Lexi Robinson, sr., Lake. Hannah Horn, sr., Tinora; Maddi Nell, sr., Otsego; Bailey Ramlow, sr., Eastwood; Sadie Estle, soph., Paulding; Aubrey Reineke, sr., Tinora; Katie Bergman, sr., Hicksville; Carissa Rosebrook, jr., Patrick Henry; Jill Hannah, sr., Elmwood. Player of the Year: Hannah Horn, Tinora. Coach of the Year: Bretta Haggerty, Tinora. Alexis Sarvo, jr., Swanton; McKenna Babcock, soph., Evergreen; Sydney Grieser, sr., Tinora; Burgin Bachman, sr., Liberty Center; Carlee Lepiarz, jr., Eastwood; Lexi Wachtman, soph., Tinora; Claire Conrad, jr., Evergreen; Sadie Sinn, sr., Wayne Trace. Morgan Leppelmeier, sr., Pettisville; Grace Swary, sr., Holgate; Erin Toland, sr., Toledo Christian; Amanda Addington, sr., Ayersville; Brittney Haines, sr., Stryker; Chloe Franklin, sr., Antwerp; Sidney McKarns, sr., North Central; Kaylie Arnold, sr., Cardinal Stritch. Player of the Year: Morgan Leppelmeier, Pettisville. Coach of the Year: John Horning, Pettisville. Hope Yost, jr., Cardinal Stritch; Regan Vaughn, soph., Toledo Christian; Claire Flegal, sr., Edgerton; Madilyn Hohenberger, sr., Holgate; Emma Siebenaler, jr., Edgerton; Claire Radabaugh, jr., Edon.